A team of scientists from the GFZ German Research Centre for Geosciences in Potsdam has now revealed a new mechanism that drives this process of fluvial erosion. 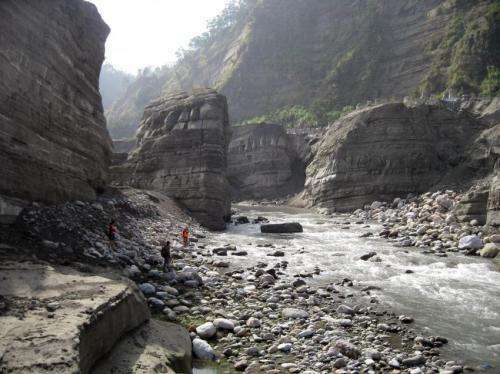 The geoscientists analyzed the development of a gorge on the Da'an Chi river in Taiwan over a period of almost ten years. There, uplift that was caused by the Jiji earthquake of 1999 (magnitude 7.6), and that runs transverse to the river, had formed a blockage. Earthquakes of that size occur there every 300 to 500 years. "Before the quake there was no sign of a gorge at all in this riverbed, which is one and a half kilometers wide", explains Kristen Cook of the GFZ. "We have here the world's first real-time observation of the evolution of gorge width by fluvial erosion over the course of several years." Currently the gorge is roughly a kilometer long, 25 meters wide and up to 17 meters deep. Initially, the gorge walls were eroded at a rate of five meters per year, and today are still retreating one and a half meters per year. The scientists identified a hitherto unknown mechanism by which the gorge is destroyed. "Downstream sweep erosion" they termed this process. "A wide braided channel upstream of the gorge is necessary," explains co-author Jens Turowski (GFZ). "The course of this channel changes regularly and it has to flow in sharp bends to run into the gorge. In these bends, the bed-load material that is transported by the river hits the upper edge of the gorge causing rapid erosion." This mechanism gradually washes away all of the bedrock surrounding the gorge and, therefore, is the cause for the planation of the riverbed over the complete width of the valley. Assuming the current erosion rate of 17 meters per year, it will take here at the Da'an Chi River only 50 to 100 years until again a flat beveled channel again fills the valley. In contrast, lateral erosion in the gorge would be too slow to eradicate the gorge in the time of one earthquake cycle. The newly discovered downstream sweep erosion is far more effective. Artificial intelligence -- child’s play!